I finally finished this quilt for my daughter. For the past few years I have been making quilts for nieces and nephews as they have turned 8, so I knew I wanted to make a new quilt for my daughter's bed for her 8th birthday. But we are in a little bit of a limbo situation where we are trying to decide whether to keep Harper in her twin sized bed or get something a little bigger, so we are gong to wait just a little while before we make a bed sized quilt. So here is our in-between quilt. It is a little on the smaller size (42" x 56"), but should be a good size for snuggling on the couch. This is actually my preferred size for using at my desk. Because Harper was not very happy about not getting her new bed quilt immediately (we are going through a little bit of a drama queen phase) I wanted to do a few things to make the quilt extra special. So the first thing I did was use Quilter's Dream wool batting. 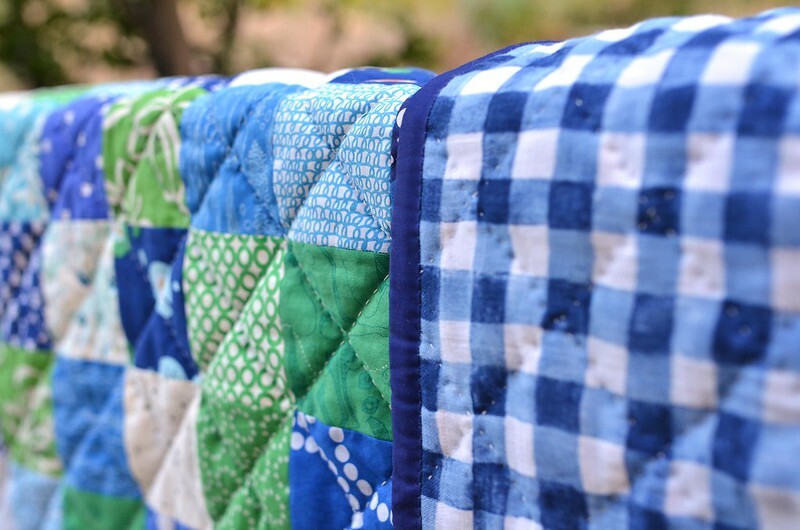 I have used wool on 4 different quilts; I have used Quilter's Dream twice and other brands twice. If you want to use wool, go with Quilter's Dream and I am not just saying that because they are a sponsor. It is awesome and fluffy and easy to work with. The second thing I did was use double gauze for the backing. 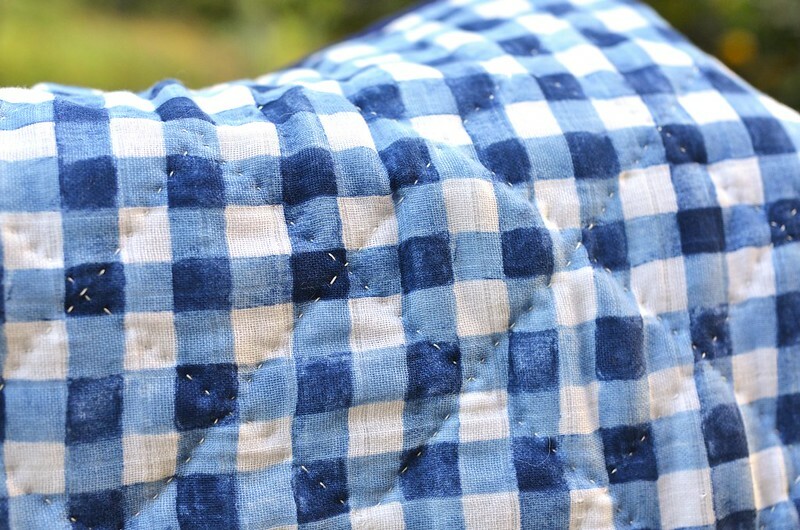 I have used it in a few quilts, but never as backing and it went better than I expected. 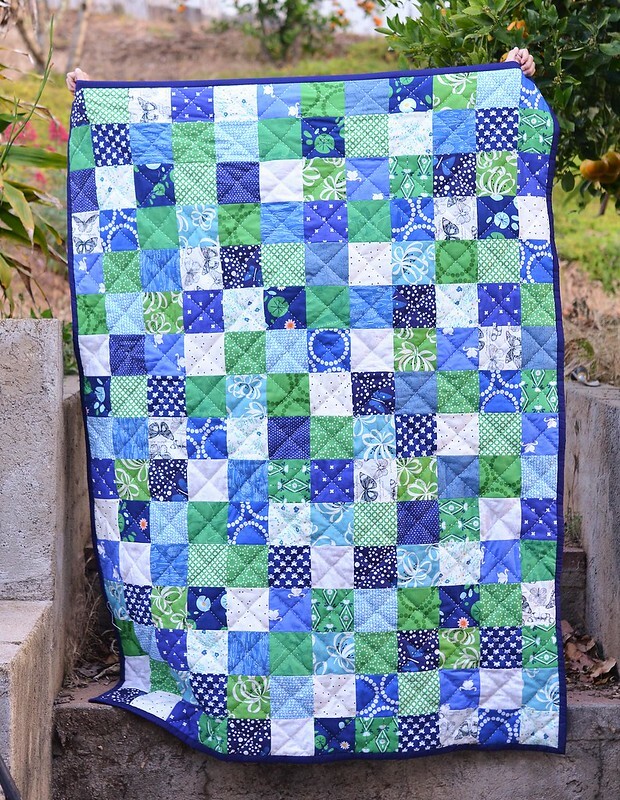 Soft and squishy and very easy to hand quilt. This is from Sarah Jane's Sommer collection. The last new thing that I tried was using voile as binding. I bought some Free Spirit solid voile in Cobalt and it was gorgeous to work with. Instead of my normal 2.5" wide strips, I cut my binding strips 4" wide. 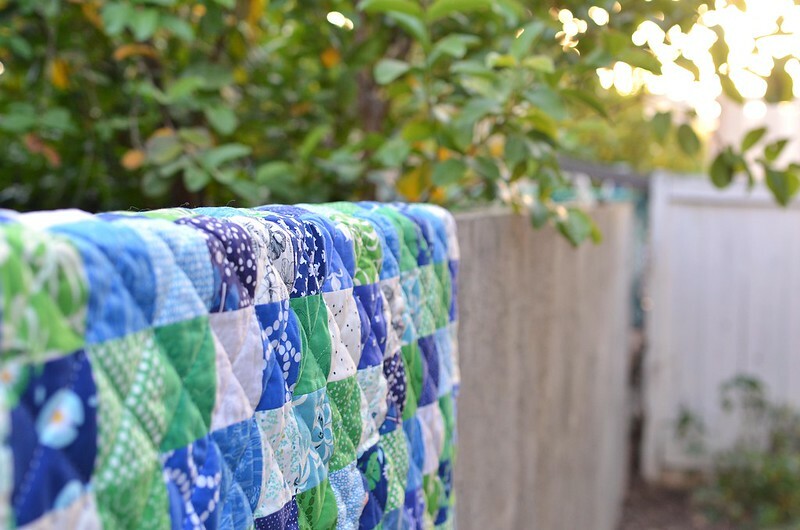 It was a fun change and it gives the edge of the quilt a nice, silky feeling. And, as you can see, I hand quilted this one. After using the extra squishy batting, the extra soft double gauze backing, and the extra silky voile binding, I didn't really have a choice. Plus I am really enjoying having a hand quilting project here and there. Or maybe I just love an excuse to lounge on the couch. That quilt is beautiful. I love the colors and all of those extras just take it over the top. Great job! Hope the young one gets over the drama soon - lol. I'm partial to blue and green. The quilt is beautiful. What kind of thread do you use for the hand quilting? Looks more substantial than just quilting thread. It is beautiful. Something familiar makes a new house seem like home.